No Additives, No Preservatives, No Artificial Anything! Made with Whey Protein Isolate. 17g Protein. 6g Fiber. Just add water. we believe we are what we eat! We take great pride in making healthy products the whole family can enjoy. 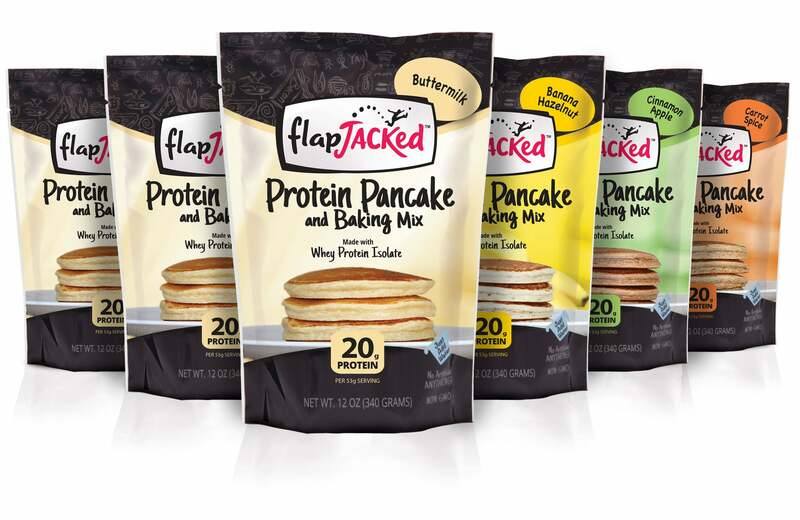 FlapJacked is made with quality ingredients such as whole grain oats, real fruit and whey protein isolate. 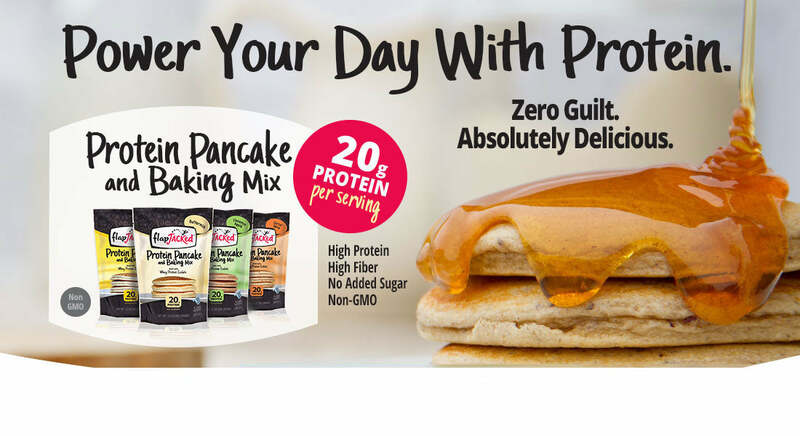 These pancakes not only taste delicious, but are packed with a fantastic balance of fiber, healthy fats and protein for a complete meal to keep your active lifestyle moving. Fuel your day appropriately. Made with whole oats and sweetened with bananas and hazelnuts, this pancake is protein-packed and fiber-rich. With only 200 calories per serving, our Banana Hazelnut Mix has a sweet, nutty flavor while modestly packing 20 grams of protein and 4 grams of fiber in each serving. Made using real apples, whole oats and coconut flour, these delicious protein pancakes are light and fluffy yet loaded with vitamins, minerals and complete protein. Each serving contains ½ teaspoon of cinnamon to help balance your blood sugar. With only 200 calories, our Cinnamon Apple Mix packs a hearty 20 grams of protein and 5 grams of fiber in each serving. Made with whole oats and sweetened with carrot juice, spices, and monk fruit, this pancake is bursting with flavor. We’ve fortified this fluffy flapjack with Whey Protein Isolate, Pea Protein and packed it with real carrots for an extra bite providing you with 100% of your DV of Vitamin A. With only 200 calories per serving, our Carrot Spice Pancake Mix has a sweet, robust flavor while modestly packing 20 grams of protein and 5 grams of fiber in each serving. INGREDIENTS:Whole Oat Flour, Buttermilk (Cultured Buttermilk made from Pasteurized Milk), Whey Protein Isolate (Whey Protein Isolate, Soy Lecithin), Dried Bananas, Hazelnut Flour, Baking Soda, Baking Powder (Sodium Acid Pyrophosphate, Sodium Bicarbonate, Corn Startch, Monocalcium Phosphate), Salt, Xanthan Gum. Whisk 1 cup mix with 1 cup cold water until well blended. Let stir for 3-5 minutes while griddle warms up. Batter thickens as it sits. For thinner or thicker pancakes reduce or add water until a desired batter consistency id reached. Heat griddle to low heat (275-285 F). Pour batter into 6-8 four inch pancake on lightly greased, pre-heated griddle. Cook until no more bubbles are forming in the center and edges look dry (about 3 minutes). Flip and cook until golden brown. Whole Oat Flour, Buttermilk (Cultured Buttermilk made from Pasteurized Milk), Whey Protein Isolate (Whey Protein Isolate, Soy Lecithin), Dried Bananas, Hazelnut Flour, Baking Soda, Baking Powder (Sodium Acid Pyrophosphate, Sodium Bicarbonate, Corn Startch, Monocalcium Phosphate), Salt, Xanthan Gum. INGREDIENTS:Buttermilk (Cultured Buttermilk made from Pasteurized Milk), Whole Oat Flour, Whey Protein Isolate (Whey Protein Isolate, Soy Lecithin), Quinoa Flour, Coconut Flour, Peaches, Baking Soda, Baking Powder (Sodium Acid Pyrophosphate, Sodium Bicarbonate, Corn Startch, Monocalcium Phosphate), Salt, Xanthan Gum. Buttermilk (Cultured Buttermilk made from Pasteurized Milk), Whole Oat Flour, Whey Protein Isolate (Whey Protein Isolate, Soy Lecithin), Quinoa Flour, Coconut Flour, Peaches, Baking Soda, Baking Powder (Sodium Acid Pyrophosphate, Sodium Bicarbonate, Corn Startch, Monocalcium Phosphate), Salt, Xanthan Gum. INGREDIENTS:Whole Oat Flour, Buttermilk (Cultured Buttermilk made from Pasteurized Milk), Whey Protein Isolate (Whey Protein Isolate, Soy Lecithin), Dried Apples, Quinoa Flour, Cinnamon, Baking Soda, Baking Powder (Sodium Acid Pyrophosphate, Sodium Bicarbonate, Corn Startch, Monocalcium Phosphate), Salt, Xanthan Gum. Whole Oat Flour, Buttermilk (Cultured Buttermilk made from Pasteurized Milk), Whey Protein Isolate (Whey Protein Isolate, Soy Lecithin), Dried Apples, Quinoa Flour, Cinnamon, Baking Soda, Baking Powder (Sodium Acid Pyrophosphate, Sodium Bicarbonate, Corn Startch, Monocalcium Phosphate), Salt, Xanthan Gum.